Keys to Raising Capital – 2 CDs - Avoid 10 common mistakes made by entrepreneurs when attempting to raise capital. 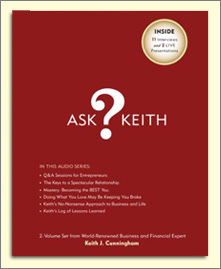 Keys to Financial Freedom – 3 CDs - What is the most important reason why you don’t have all the money you want? FEAR! Find out two easy steps you can use to successfully overcome this obstacle. 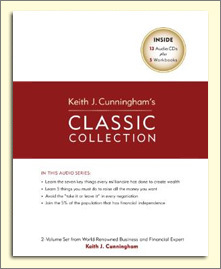 Keys to Creating Wealth – 3 CDs - The keys to creating wealth has less to do with the tool belt and more to do with the questions we ask ourselves. Learn the seven key things that every millionaire has done to create wealth. Keys to Power Negotiating – 3 CDs - What are the three biggest reasons you have inconsistent and spotty results in your negotiations? Learn the key steps to avoid the “take it or leave it” in every negotiation. Keys to Getting What You Want – 2 CDs - Everything you will ever own is currently owned or controlled by someone else. Learn the two most crucial keys to getting what you want.